Bemoaning the fact that you don't have enough time is an exercise in futility. The fact is that there are only 24 hours in a day--exactly 1440 minutes--no more no less. How you use them is the key to successful time management. You can never really save time. Your options are to spend it or invest it wisely. Putting in more hours is not the solution. During my initial coaching sessions with an executive, I determine if clients have a need to improve their time management skills. 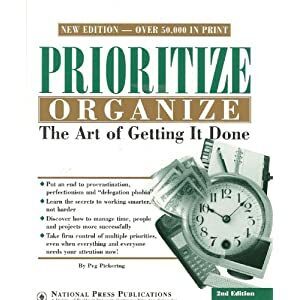 If they say they have difficulty in this area, I always recommend that they first answer the following Self-Management Profile derived from Prioritize, Organize: The Art of Getting it Done and purchase the book as a resource. It's a small price to pay to help them get on the time management track. Review the list below and check off those for which you would respond with a "yes." The more check marks you have, the more habits you'll need to rid yourself of so that you can more effectively manage your time and productivity as well as reduce your stress. ___1. I do what I like before I do what I don't I like. ___2. I do the things I know how to do faster than the things I don't know how to do. ___3. I do the things that are easiest before doing the things that are hard. ___4. I tackle small jobs before I tackle the large jobs. ___5. I do things for which the resources are readily available. ___6. I sometimes do unscheduled things before I do scheduled things. ___7. I respond to demands from others before I respond to the demands from myself. ___8. I o things that are urgent before I do things that are important. ___9. I readily respond to crises and emergencies. __10. I do interesting things before I do uninteresting things. __11. I do things that are politically expedient. __I 2. I do things that provide the most closure. __13. I respond on the basis of who wants it. __15. I work on the squeaky wheel principle. If you are looking at the latest technology in androids , check out what's going on at the Cellular Telecommunications Industry Conference (CTIA). Some of the new android functions can be either time savers or time wasters, so be careful not to get caught up in the excitement.